30 Bookings in 30 Days of April! If you have been waiting to get in on the Best Senior Portraits in Dallas, now is your time! For the 30 days of April, we are having a mega sale to book all 30 days! 50% off your session fee, which is regularly $250. We thought this would be a fun idea for the first 30 people who call to book and we want YOU to be a part. SPECIAL - Free In-Home Consultation! Which Photo Shoots are you interested in? We created the Fashion Sports Portrait for students and parents that wanted a higher level of quality than what was typically presented for senior athletes. We wanted it to look and feel like you were being featured for a magazine like Sports Illustrated, GQ, Vanity Fair, or similar celebrity magazine. 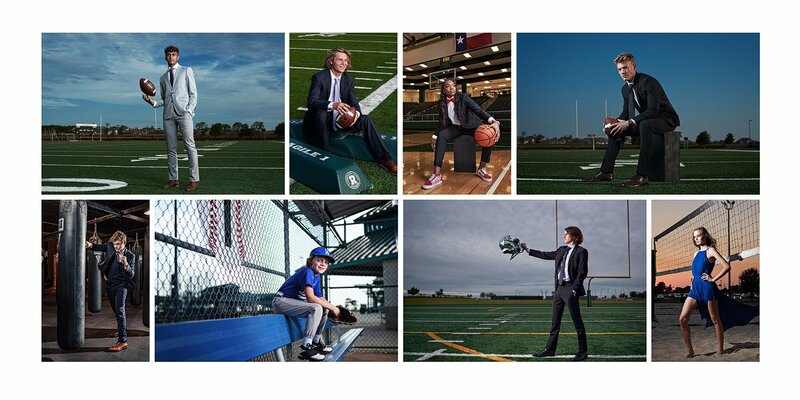 We wanted to elevate Dallas Sports Portraits to a whole new level. The Fashion Sports portrait was born. It’s simple. All you have to do is fill out the form above and someone from our team will give you a call within 24 hours to start discussing your photo shoot. We will go through everything that you need to know from location, wardrobe, finished artwork and concepts for the photo shoot itself. There is no need to worry about anything, we have you covered. We work hand and hand with local High Schools to gain access to photograph on the ball field, or we can also do these photo shoots with awesome ideas pretty much anywhere. Get 50% Off Your Senior Session Price! We can discuss wardrobe options with you on the phone, but typically students will do two to three different outfits. We are well known for a well fitting suit for the guys or a stylish fashion outfit for the ladies. They will often do one fancier outfit, a more casual but fashion forward outfit, and then possibly something with a letterman’s jacket or uniform. Take a Photo With Mom! We want you to celebrate this milestone in your life with your family! Bring mom or other members of the family for a quick photo together at the end of the photo shoot. No extra cost. Just purchase the prints that you would like. Just fill out this quick form below if you haven’t already. Thank you!